Why has the Bush administration been dancing around the question of whether waterboarding is torture? 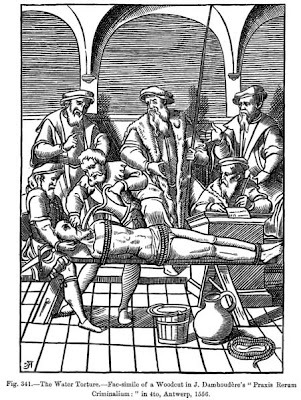 Waterboarding was one of the most common tortures employed by the Spanish Inquisition for the first half of its 450-year-long history (circa 1480-1834). This has never been a secret. It is attested to by reams of documents - letters, debates, manuals of instruction and copious records of trials that include verbatim accounts of the torture sessions themselves - in the Historical Archives of Spain and Mexico, in which I have worked for the last 30 years. The information about inquisitorial waterboarding has also been available to the English-reading general public since publication of H.C. Lea’s A History of the Inquisition, the last volume of which appeared a hundred years ago this year. The Spanish Inquisition, unlike many American lawmakers and members of the executive branch, did not waffle about labeling waterboarding a torture. Waterboarding was not invented in Spain: Since the middle of the 13th Century it had been used by European civil and ecclesiastical courts, particularly the Papal Inquisition, in Rome. In Spain no one voiced doubts, as did Michael Mukasey during his October confirmation hearings for U.S. attorney general, and at a hearing just the other day, about whether waterboarding might not technically be torture. President Bush, on the other hand, has no doubts at all. Unlike his nominee, he spoke with inquisitor-like certainty when he proclaimed that our physically coercive techniques “are safe, they are lawful and they are necessary.” He apparently sees no contradiction in simultaneously insisting that these “classified interrogation procedures” be conducted offshore so as to remove them from the jurisdiction and safeguards of the American judicial system. The Spanish Inquisition guaranteed to the accused many of the legal protections that the current administration has worked so hard to sweep under the rug. Within the context of their times the Inquisition’s stance, succinctly laid out in its 1561 Manual of Instruction to Inquisitors, was remarkable. Both the prosecuting and court-appointed defense attorneys had access to the substance of all of the testimonies relating to the accused. The accused could disqualify the testimony of anyone whom he or she could prove had animus against them. Inquisitors had to weigh the full arguments of the defense and the prosecution before ordering a torture session. The order required a unanimous vote of the judges. If the defense attorney didn’t accept the decision, he could appeal the ruling to the Inquisition’s Supreme Council (though in practice they rarely did). Gathered in the torture chamber itself were the inquisitors, a bishop’s representative, and a recording secretary adept at speedwriting, which was the videotaping of its day. The attending doctor could rule the accused unfit to be tortured, and could order the procedure stopped at any time. Once the accused was brought into the torture chamber, he was offered several chances - the average seems to have been about six- to make full voluntary confession. Fear in the presence of imminent pain was generally enough to loosen the accused person’s tongue. It was only when fear alone did not work that torture was applied, with each step of the procedure, each jar of water and turn of the winch, each question and each choked-out answer, duly noted by the recording secretary. None of the participants ever destroyed those documents out of fear of embarrassment or indictment for their actions. Nor did their bosses. The original recordings were archived, and after 500 years are still available. I am not praising the Spanish Inquisition. I know enough about the real Inquisition - not the cartoon version of Monty Python nor the sensationalist horrors of the Black Legend - to know that the Inquisition was heinous in almost every way. Though debates raged then and still rage among scholars about the reliability of the information elicited by these procedures, there is no disagreement about one fact: Waterboarding was torture. That was its intent, and that, in conjunction with a variety of other torments, was how the Spanish inquisitors used it. Even today popular imagination condemns them for it. For the United States to adopt even one of the Inquisition’s torture techniques exposes us, rightly, to moral condemnation. The United States has long been a beacon to the world for its ethical principles (even when sometimes these have been honored in the breach). Equal treatment under the law. Habeas corpus. Free and open discussion informed by access to information and a free press. Checks and balances to ensure that these rights are protected. That the Bush-Cheney administration has squandered our human and material resources in this so-called war against terror is a calamity that will affect us for decades. But that they have blown away our moral capital, that they have compromised the principles that define us as a nation, that is a tragedy. David M. Gitlitz is a professor of Hispanic studies at the University of Rhode Island. © 2008 The Providence Journal Co.